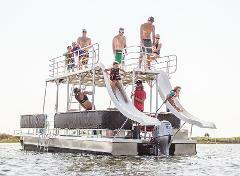 Double Decker Pontoon boat holds up to 12 passengers, has 2 levels and 2 water slides, 90 HP and comfortable seating! Fun for the whole family!! 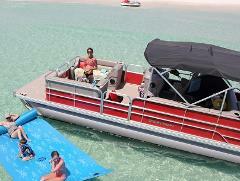 Double Decker Pontoon boat holds up to 12 passengers, has 2 levels and 2 water slides, 90 HP and comfortable seating! Fun for the whole family!! Prices to the right vary depending on the time of year. 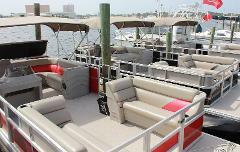 Pontoon Boat Times: Half day 8:00 am - 12:30 pm or 1:30 pm- 6:00 pm. Full day: 8:30 am - 5:30 pm. We provide you with instruction on the proper use of the vessel. Maps of the area, all safety gear and fuel are included with your rental. 2 hour Guided Jet Ski Adventure Tour! 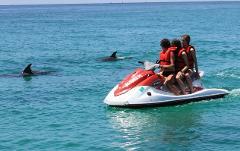 Fast paced adventure for the whole family that includes dolphin encounter, exploring shell island, snorkeling and more! !